Atria Books/Beyond Words, 9781582702421, 224pp. How can a blessing change the world? According to Pierre Pradervand, making the conscious choice to bless every person or being around you can truly make a world of difference in yourself and in others around you. In The Gentle Art of Blessing, Pradervand shows that the practice of blessing has the power to create more than just a renewed perspective. It unleashes tangible benefits throughout your entire life -- through your daily interactions, your life-long relationships, and in the way your approach your place in the world. Pradervand describes blessing as genuinely wishing the best for another person through seeing their individual worth and honoring them for it. 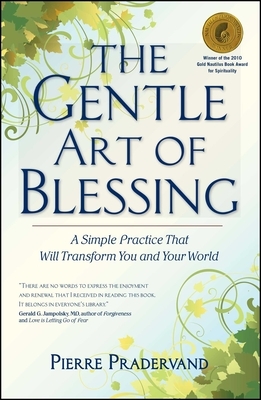 By looking at several different perspectives -- providing spiritual inspiration from Hinduism, Taoism, the Koran, the Bible, and other important spiritual sources -- The Gentle Art of Blessing explores the potential in shifting one's attitude from confrontation and negativity to acceptance and enthusiasm. A powerfully simple way of perceiving and shaping our surroundings, blessings can reflect the unconditional love and acceptance that is necessary for world -- and inner -- peace. Pierre Pradervand has worked for decades in personal development social justice. His impressive career includes work on nearly every continent, and as a speaker and workshop facilitator, Pierre is often gives talks on the topic of how to live differently. In his workshops, he provides personal development tools that empower everyone to find and strengthen their internal anchors. There are no words to express the enjoyment and renewal that I received in reading this book. It belongs in everyone's library. This is a book I can highly recommend. It is a book of silent action. It is something we can all do, and do it all the time, when we remember. So often we have to be reminded, and this book can remind us. This is a simple, democratic, grassroots spiritual practice that gradually brings more love into the life of the person who practices it and into the world. The Gentle Art of Blessing is an antidote for resentments and an invitation to become a bigger soul.